And still no apology by these morons! Nice article. thank you for providing these details. If I recall correctly, Robert Fisk wrote about this in his book, "Pity the Nation". I believe he interviewed the air traffic controller at the destination airport. The Americans had claimed that the Iranian flight 655 was broadcasting on a military transponder frequency, a claim which was NOT supported by the air traffic controller. Obviously, the context for this horrific incident in 1988 was the Iran-Iraq war. The principal reason the war even continued well beyond 1982 (after Iraqi forces had been expelled from almost all Iranian territory) was Khomeini's insistence on continuing the war until Karbala and Qods had been "liberated". Only after 6 additional years of futile death and destruction, Khomeini was finally forced to accept the failure of his psychotic quest and "drink the poisoned chalice" (his words). 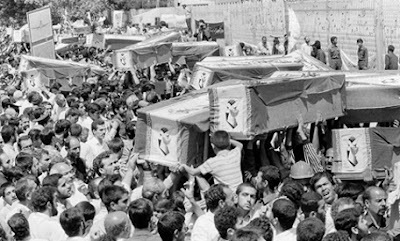 It was this stance by the Islamist regime and its use of hundreds of thousands of young men and boys (some as young as 12) as cannon fodder that constitutes the greatest "war crime" against Iranians by the IRI. You need first of all to revise your method of thinking, and secondly to learn some more history. Firstly, Saddam. Your post is about "crimes + Iran-Iraq war," and you fail to mention his name. That means you fail at life. Saddam invaded Iran. Saddam invaded Iran. Saddam invaded Iran. This is the most principal fact of the war, with many secondary facts that derive from it. But it remains: Saddam invaded Iran. Iran did not invade anybody, by the command of Imam Khomeini or anyone else. OK? Saddam was the aggressor. Even the UN has recognized this. He invaded Iran with grandiose expectations. He bragged before the invasion that his forces would march in Tehran in two weeks. In the air war, he wanted to emulate Israel’s surprise attack against Egypt in 1967 (where they destroyed most of Egypt’s planes on the ground). Neither of those worked out. He gained limited successes; the Bathist army conquered Khorramshahr and besieged Abadan, and that’s as far as they got in the South (which was his main focus because he thought he was "liberating" Iran’s Arab minority population). Iran was starting to win, and then suddenly he becomes interested in peace? And you, being so kind and understanding, take him for his word? Saddam was a racist. And he was a chauvinist. He saw himself as a modern Muawiyah. He wanted to be the conqueror of Persia. This racist and aggressive motivation is what started the war, and by extension is responsible for all of the crimes that were committed. He saw what he thought was an opportunity to bring Iran to its knees, and he took it. And it failed, because the Iranian people gave him a smack across the face. And then after two years of failure he became a peace-loving dove. This is what you are convincing yourself. Because you are an idiot. Before the war, Iraq had a strong armed force. But after the war, he had an insanely large force. 6 thousand tanks, 10,000 armoured vehicles, 10,000 artillery pieces, 1,500 aircraft, 1,000 helicopters. And one million and a half men under arms. This is because throughout the war, foreign suppliers were arming him to the teeth (mostly the USSR and France… the US provided chemical weapons and AWACS and other intelligence support). Saddam was a worthless piece of garbage but he understood one thing well: Iran was isolated. Saddam had an endless supply of Eastern and Western weapons; and Iran had only the DPRK, Syria, and Libya. He wanted to sign a quick cease-fire because the initiative had been taken away from him and he wanted to take it back. He wanted his forces to recover, to regroup, and to re-plan their attack. If you remember (which I am sure you don’t, because you are an idiot), at the start of the war, USSR was not so much in Saddam’s camp as they were through the last six years. This was in a period where it was not clear how their relation would be with Iran. But after Iraq started to lose, they thought it was necessary to put a full support behind Saddam. Saddam wanted to sign a cease-fire with Iran, offering NO reparations for his crime against the Iranian nation, with Iran getting no guarantee against future aggression, and you except the Iranian nation to accept this??? And you call Imam Khomeini "psychotic" for not accepting this ridiculous proposal??? You are too low. This is not a political issue. The blood of martyrs is not something to be devalued because you have a political disagreement. The Iranian nation has contempt for your type. "In January 1985, former prime minister and anti-war Islamic Liberation Movement Mehdi Bazargan criticised the war in a telegram to the United Nations, calling it un-Islamic and illegitimate and arguing that Khomeini should have accepted Saddam's truce offer in 1982 instead of attempting to overthrow the Ba'ath. He added, "Since 1986, you have not stopped proclaiming victory, and now you are calling upon population to resist until victory. Is that not an admission of failure on your part? ":252 Khomeini was annoyed by Bazargan's telegram, and issued a lengthy public rebuttal in which he defended the war as both Islamic and just." "Iran Refuses Peace Offering (June, 1982): After Iraq withdrew from Iran, the Ayatollah Khomeini proclaimed that Iran would invade Iraq. Saddam, with the backing of fellow Arab states (fearful of the Shi'a Revolution being exported into their lands), offered favorable terms to Iran in order to end the fighting. The offer included $70 billion in war reparations. Iran refused, insisting that the only acceptable resolution was the removal of Saddam from power, replaced by a Shi'a Islamic Republic." First, thanks, Nima. Another beautifully written and argued piece. Many Americans were appalled by the event and nauseated by Rogers' faux "heroism". Thank you for keeping this issue alive. Second, I would like to point out that that is not an F-14 in your graphic. It looks more like a Mirage. Third, I am grateful for Hossein for explaining that, hey, it's OK if children are wrapped in prayer rugs and sent to clear mine fields as long as their parents (both parents!!) sign off on it. That really makes me feel better. This point more than anything advises the west of the type of "people" we are dealing with. I mean, what is this? Iranians are upset that the US would martyr scores of "mothers and their children" aboard 655 but they are not upset that an ayatollah would murder tens of thousands of Iranian children under the guise of "martyrdom." How sick does it get? Perhaps, Nima, you could explain this to us: If Iranians revere martyrdom so much, then why do they have a problem with the 300 martyrs of 655? If Iranians are OK with killing thousands of their own children, as Hossein makes clear, then why should anybody in the west be upset about 655? @Denis - The above graphic does indeed appear to show an F-14 Tomcat, and not a Mirage. Mirages have fixed delta wings, and the body of the plane extends a bit past them to the rear. F-14s, however, have variable geometry wings, which - in the image above - are swept back, as they would be in attack position. My goof duly noted. Thanks.